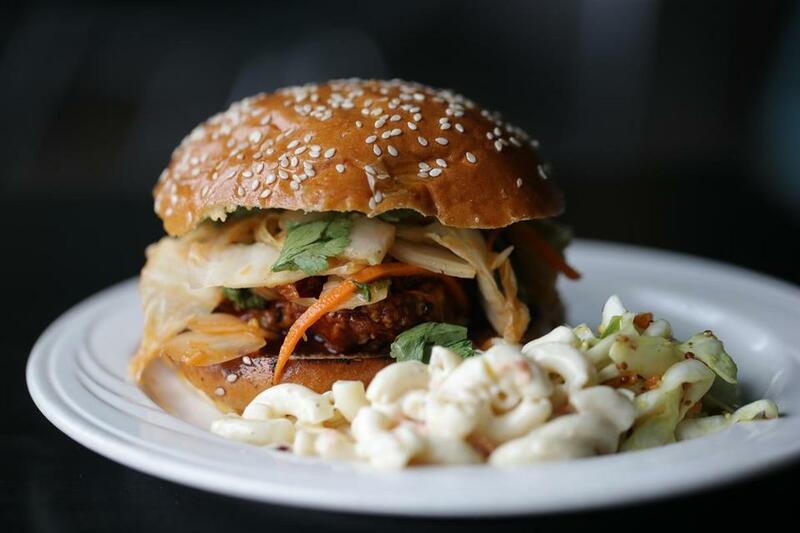 Korean fried chicken sandwich at The Automatic in Cambridge. CAMBRIDGE — Your instincts might tell you to be wary of a place that offers frozen blue margaritas, Portuguese Chex Mix ($4), and Frito Pie From Hell ($7), but you’d be wrong at The Automatic, which opened last November in Kendall Square. Here, the cocktails are expertly concocted and the friendly servers steer you toward mostly delicious offerings, like that slightly salty and not-too-sweet blue margarita ($11) which, despite looking like something you’d order for the first and last time on your 21st birthday, tastes of fresh lime, agave, and decent tequila, or the gochujang-slicked Korean fried chicken sandwich ($10), topped with sweet-tart and funky housemade kimchi. The Automatic has a millennial vibe with a 74-seat wood-paneled room, poured concrete floors, and delicious frozen drinks. But this is not the owners’ first rodeo. After a decade of throwing around the idea of opening up a bar, East Coast Grill founder Chris Schlesinger and B-Side Lounge bartender Dave Cagle decided to do just that. And it definitely is a bar. Though there are tables and booths arranged around the shiny cement slab that is the focal point of the inside space, both the cozy interior and the sizable sun-drenched patio — which can seat another 40 — seem built for imbibing. Cagle says he and the team, led by Martin Su, of the now-shuttered Flora restaurant in Arlington, did a lot of crowdsourcing to “create stuff restaurant people love to eat, full of complex spice and acidity.” That comes out in a crispy pork belly special ($9), lacquered with a savory house-made oyster sauce and served with an Asian apple and red cabbage slaw. The Underappreciated Blackened Fish Sando satisfies with spice-rubbed pollock, grilled pineapple, and a Tabasco remoulade. 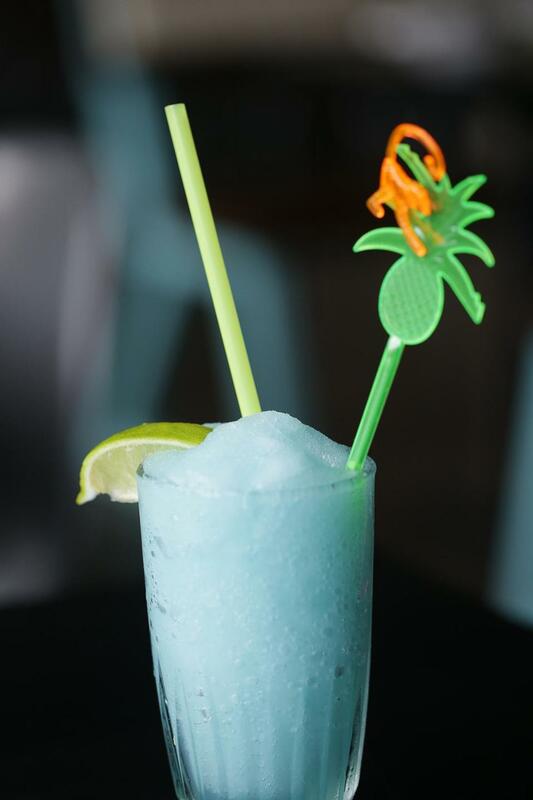 Its tropical flair is reminiscent of something you might eat over at East Coast Grill. Big fans of the ECG buffalo shrimp, we took a chance on the buffalo fried sweet plantains ($6.50). Unfortunately, the fried fruit is cloying under the breadcrumbs and blue cheese crumbles and the whole thing feels heavy, with too much mush. Funky fries at the Automatic. The flat patty burger ($8) is groan-worthy. It’s topped with just your standard lettuce, tomato, onion, and “super secret sauce,” but there is some alchemy happening that makes it the ideal burger, especially after one of those alcoholic slushies that just went down like juice. And with burgers, you’ve got to have fries. 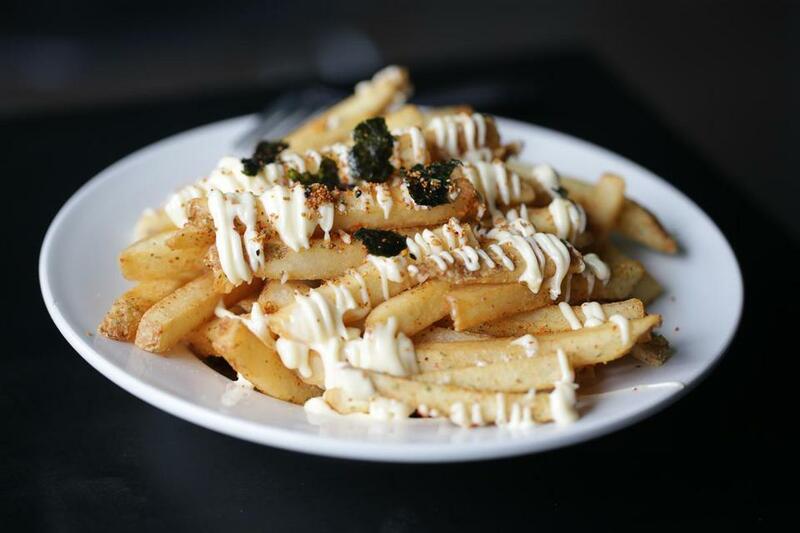 Funky fries ($7.50), with spicy togarashi seasoning, Kewpie mayo, and crunchy bits of nori are on the pricey side, but we finish every last one. Freaky fries ($10) are an umami bomb with parmesan shavings, “meat debris” (shreds of pleasantly chewy beef), and a split bone that, in our case, went untouched as the marrow was ice cold and rock solid. When the server inquired about our food, and we were honest about missing the custardy marrow, he took the item off our bill without batting an eye. The service is particularly good here. The staff seems genuinely happy and interested in making sure you are, too. From steering you to the right drink or can’t-miss special, to making sure the New England frankfurter ($6.50) — a Pearl hot dog with snappy casing, soft bun, and sides of vinegary slaw and mac salad — comes out STAT when you’ve got a rambunctious toddler in tow. Between sampling the lunch and dinner menus, we missed out on trying izakaya-style meat skewers ($4-$4.50), snackable sticks of beef hearts, cumin pork, and nori chicken. And how did we not order that Frito pie with Schlesinger’s famous Inner Beauty Hot Sauce? Or the Miami Vice cocktail for two ($25)? Hours Mon-Fri 11 a.m.-2 a.m., Sat-Sun 4 p.m.-2 a.m.
Catherine Smart can be reached at cathjsmart@gmail.com. Follow her on Twitter @catherinesmart.